This Bengal Handloom Cotton Silk Saree in Black with Contrast Pallu and a blouse piece is from the capsule collection ‘Return of Indian Colours”. Saree: 5500 c.m. (5.5 m) X 120 c.m. Blouse: 90 c.m. X 120 c.m. 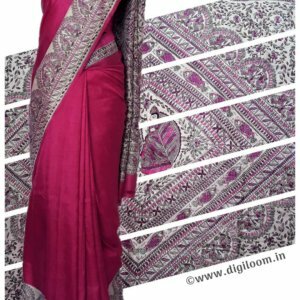 This Cotton Silk Saree is hand woven in hand-loom. It took 5-6 days to weave this saree. Do not wash it in washing machine. The blouse shown in the image is from our inhouse blouse piece, hence the actual blouse piece looks different from the image.